After months spent cozying up at home doing everything possible to stay warm, the temperatures are finally starting to rise, putting us in the mood to put a few new getaways on our calendar. Of course, as fashion lovers, having a chic designer luggage set (along with the perfect airport outfit) is the perfect way to get yourself a travel photo that could rival the likes of your favorite influencers. While what you pack inside your suitcase is pivotal for a stylish vacation, luxe luggage will ensure your trip is fashionable from the moment you leave for the airport to when you return home. We know investing in quality luggage can put a major dent in your bank account, but designer luggage will never go out of style. If you’re ready to upgrade your travel style, scroll down below to shop complete designer luggage sets. 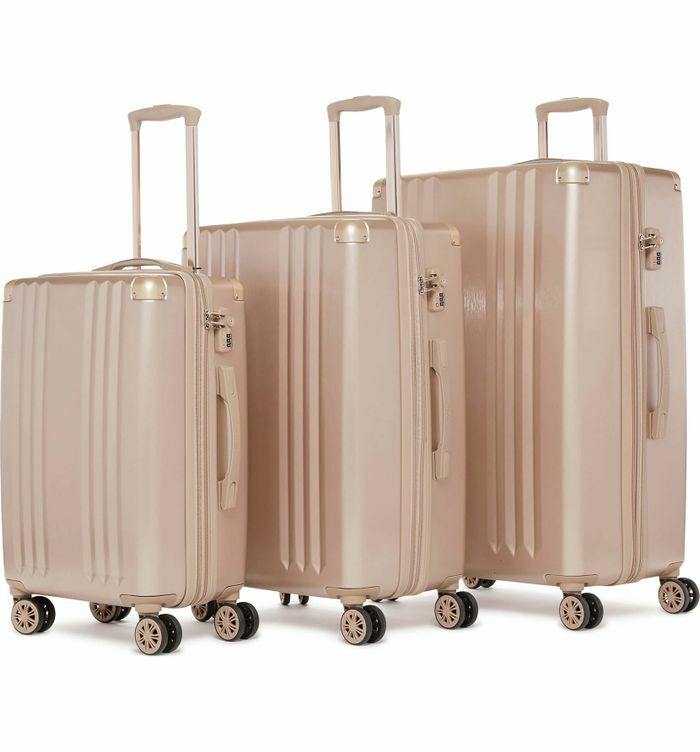 Champagne luggage will feel so chic. You can’t go wrong with a classic silver bag. The outer shell of this luggage is made of sturdy PVC. This luggage comes with adjustable straps and a lock security system. This case comes with a jewelry tray as well as elastic straps to hold your perfumes. This bag has a cool, vintage-inspired appeal to it. For those who love the logo trend, this luggage set is for you. Travel in style with this case. The size of this case is perfect for your shorter trips. Nothing says luxury like Louis Vuitton suitcases with the brand’s signature monogram. Inside this suitcase, you’ll find mesh lining and a TSA-approved lock that’ll keep your clothes safe en route. The golden tint of this feels so cool. Perfect for those longer trips you have coming up. This trunk is thinner in width and deeper than the standard suitcase. Sleek and simple, this carry-on guarantees undeniably travel style. The texture will make this set stand out from standard black suitcases. Tumi will always be a great option for traveling in style. Now that you’re all set, add a chic backpack for all your carry-on necessities.